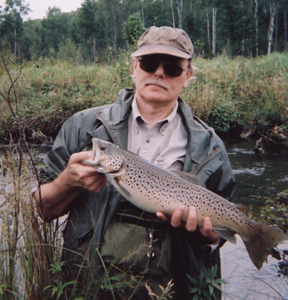 Michigan has a long gap between the last day of regular trout season and the start of the next. 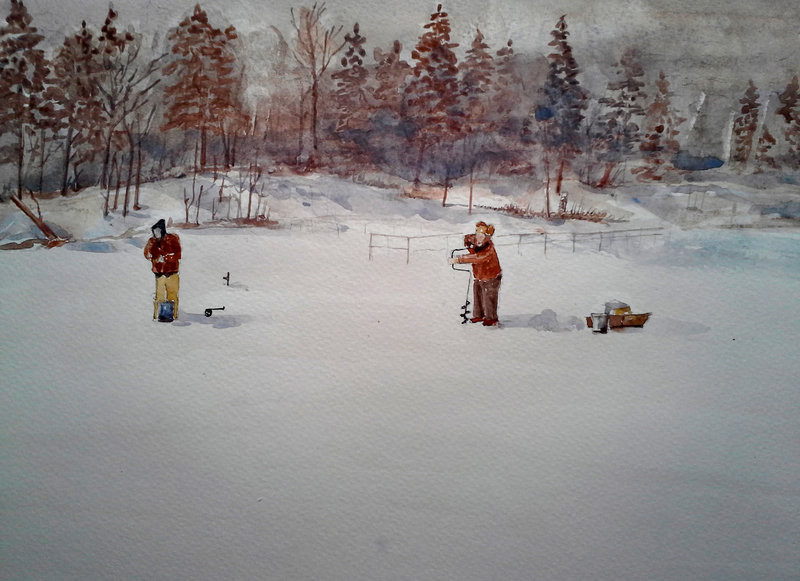 I usually turn to indoor hobbies when winter arrives though Feral and I have ice fished a couple times over the last few year. Once on Leverentz Lake with his buddy Chuck, an expert on lake fishing, ice of not. A few days ago I tried to paint Feral and Chuck from a photo but my attempt at watercolor turned somewhat muddy from over painting. I may try painting this again in hopes of doing a better job. I will say this about the painting – it looks cold out there and it was. Feral and I set up tip-ups for pike and Chuck concentrated on panfish and perch. Chuck caught a mixed dozen. Feral and I got zip but enjoyed watching Chuck work his magic. Feral and I used to write letters back and forth in the winter, snail mail, hyping the distant trout season. We’d add a photo or two from the previous season. Fun getting a real letter instead of email. I may start that up again. If he reads this post I may get an invite to ice fish, ideally on a sunny day with temperatures more toward freezing rather than the zero temps we have now. A nice mess of bluegills, crappies or perch would taste pretty good about now. A trout dinner is along way off.